Biotechnology in India is one of the fastest growing sectors and is expected to continue playing a pivotal role in shaping India into a knowledge economy. Some of the key factors which offer India a competitive advantage include the availability of research and development (R&D) facilities, knowledge, skills and cost effectiveness. The Indian Bio-tech industry currently holds 2% of the global biotech market which is largely dominated by the US (with a share of 41%). Despite a global meltdown and reduced capital flows into emerging countries, the Indian biotech industry has recorded a growth of 18% in rupee terms at Rs 121 billion. With long gestation periods and high technical complexities, funding in Indian biotech development companies has been highly diffused. While various incubation models have been tested in the US, Europe, Brazil and China, in India, such incubation clusters are concentrated in a few select cities with government agencies and institutes emerging as the innovation hubs. Up to 2009, the Biotech industry in India has had to rely largely on government support in the form of grants, parks, fiscal incentives etc with limited participation from Indian corporates. Even though Private Equity ('PE') and Venture Capital ('VC') funding has been flowing into India over the last 5 years, it has not been able to lend the required thrust to biotech. Only a small fraction of the PE and VC investments are invested in biotech innovation owing to the complexity, uncertainty, long gestation period and risk involved in such setups. Has government support become the dominant financing form for this sector? What are the current schemes and support mechanisms which are already in place? Can PPP play a pivotal role in the development of this sector? What are the key opportunities under the PPP model? What is in it for the government? What are the key challenges on the road ahead? Are there any other innovative investments and return models? 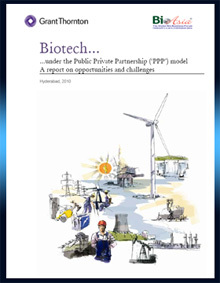 What is the way forward for PPP in Biotech? Research & Development (R&D) activities, in particular, drug discovery requires concentrated efforts at various levels, multiple skills and expertise. The global drug discovery industry is facing considerable challenges due to increasing costs, decreasing productivity, funding pressures and attrition of projects as they progress through the development process. Companies and health organisations across the world are responding with extensive re-organisation, restructuring and re-focusing in order to address the issues around R&D productivity, process inefficiency, project attrition and the increasing costs of taking a potential new drug to the market and to secure profits. Global structural changes have created an avenue for the Indian drug discovery companies who are trying to move up the value chain from being generics to NCEs. The efforts of the Indian Government to finance R&D through its Public Funded R&D bill and the setting up of a Rs 20 billion venture capital fund to finance research and development work, is encouraging with the government acting as a financier as well as steering regulations. 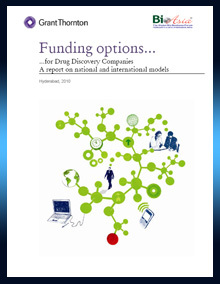 With large pharma companies having separated their discovery and research activities to enhance their focus and commitment towards the area, the drug discovery and research industry at large has been unable to secure significant investment independently. Do all R&D companies share the same financing model? What are the critical success factors for choosing a particular investment and financing model? What have been the traditional financing models used in this sector? Are there any new and creative financing approaches available to young discovery companies? What are the different exit scenarios available? The global biotechnology sector has witnessed various regional shifts - with the West emerging as the land of capital and Asia shifting strategically from a mere outsourcing destination to a centre of innovation. In this paper, we attempt to bring out key drivers of this regional transformation in Asia and analyse this era of research-based alliances. Alliances that reward bio-innovation have been the name of the game in the global markets. The leaders of this bio-frenzy in the Asian region have been Japan, China and India, witnessing some of the largest deals of varying types: the traditional biotechpharma deals, biotech-biotech deals and ubiquitous M&As. The big pharma push towards generics in emerging markets; non-exclusive licensing arrangements in biotech; investment capital provided by the West; faith in the discovery of biosimilars; and milestone-based alliances have been some of the innovative outcomes of this year's bio-deal monitor. Asia promises to become a biotechnology hub and this is made evident by the growing number of cross border collaborations in this sector since 2010. 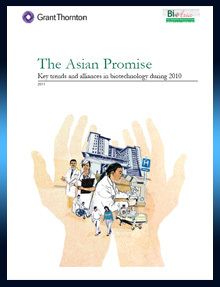 The region's thriving biotechnology sector has been driving innovation on its own over the last decade - Asia is now set to be a significant centre of developmental expertise. A fact now acknowledged and respected by the world, evident in the flurry of collaborations in 2010.